Josh Millerd is the proud owner and director of Pet n' Vet; a unique pet care service for San Diego. His primary focus is bringing you loving, skilled and compassionate animal care to your home while also providing in-hospital quality services in conjunction with the area's finest veterinary hospitals. 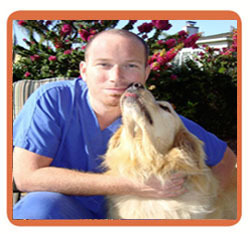 Josh is a California State Registered Veterinary Technician and President and Founder of Pet n' Vet Support Services, with over eighteen years' experience providing pet and vet-related services for in-home medical care. Josh specializes in many medically complex procedures including mobile diagnostics, medical testing, and hospice care. Additionally he works as an independent contractor providing relief work for various veterinary hospitals in San Diego. Josh's goal in creating Pet n' Vet was to fill a void by allowing him to provide a link in animal health care, connecting pet owners and veterinarians. He supports the care of older pets, many of whom have special needs requiring advanced medical treatments and testing. Having had many pets myself I understand how difficult it can be transporting your loved family member in for treatments and testing. It can be a traumatic experience for both the pet and you. Josh and the Pet n' Vet team are a dedicated and certified staff here to ease your burden. We bring health care to your home. Pet n' Vet works with you and the veterinarian regarding medical needs. I want to ensure excellent, coordinated medical care. In addition, Pet n' Vet gives pet owners peace of mind when they travel, by providing loving care for pets that require more basic support and attention, such as walks, meals and overnight companionship in their owner's absence. Josh is a San Diego native. He has studied extensively in the veterinary field and takes active part in many continuing educational seminars that present new developments and ideas in the field of veterinary medicine. Out-of-office hours for Josh are filled with his animals, both his own and friends' or family pets. He has a black/white cat named Ratchet and a Siamese/Cornish Rex named Nigel. Josh also enjoys snowboarding, cooking classes, wine tasting, camping, and is an avid fan of off-roading. He is also a member of the California Veterinary Medical Association and the San Diego County Veterinary Medical Association. Read Josh's profile and or resume at Linkedin for more information.